(L-R) LaKaiya Evans, Lindsay Kersey, Kim Truncale, Christina Stroup, Rikki Conner, and Lori Calloway. PHOTO by Larry Lipton and Douglas Kreitz. In the case of the current Texas Repertory Theatre production of BEEHIVE The 60’s Musical, I hope my readers will forgive me if I depart from my usual habit of sequential reporting. Let’s begin then with Act II. It was marvelous! Now bear in mind that what we are dealing with here is really more of a musical revue than a plot-organized musical in the traditional sense. In fact, there really is no plot. But as the title suggests, there is plenty of hit music from the 1960’s as the pleasant show tips its hat to the women who sang those songs and wore the beehive hairdos so popular at the time. In his notes to open the printed program for the show, director, Dan O’Brien promises, “…a nightly dose of up-doos, great songs from the 60’s and 70’s girl groups, nostalgic choreography, and campy humor.” He and his talented cast of six young ladies (Lori Michelle Callaway, Rikki Conner, Lakiaya Evans, Lendsey Kersey, Kim Truncale, and Christina Stroup) deliver on all counts. That same printed program omitted details of the original Broadway show, and also failed to have either a running song list for the show, or any clear indication as to which of the gals was featured in the various stunning musical numbers sprinkled throughout this production. That oversight, in my view, is a disservice to both cast and audience. But I will respect the decision, and though I think some deserve it, I will not attempt to put the spotlight on individual performers here since the show is very much an ensemble effort. Putting all that aside, I was glad to see Trey Otis acknowledged as designer of the colorful and eye-popping set that was well-lit by designer, Eric Marsh. Likewise, it was lovely to see the program give credit to costume designer, Tiffani Fuller, who must have spent many late nights coming up with such a large array of colorful, sparkling and glamorous outfits for the ladies. Choreographer, Lauren Dolk, added to that glamour as she kept the dancing bright and appealing in a space that was somewhat limited by the onstage presence of a six-piece band (Music Director, Luke Kirkwood). It was clearly comprised of very talented musicians. They did a fine job in Act Two and did not overwhelm the terrific voices of the singers by playing too loudly (as was the case in Act One). That second act opened with a riveting send-up of Tina Turner that was pure dynamite. In gowns of glittering silver and sequins, our Tina and her back-up singers captured all the excitement, movement and gyrations of the original group. The frantic rendition of the classic, “Proud Mary,” was sensational. 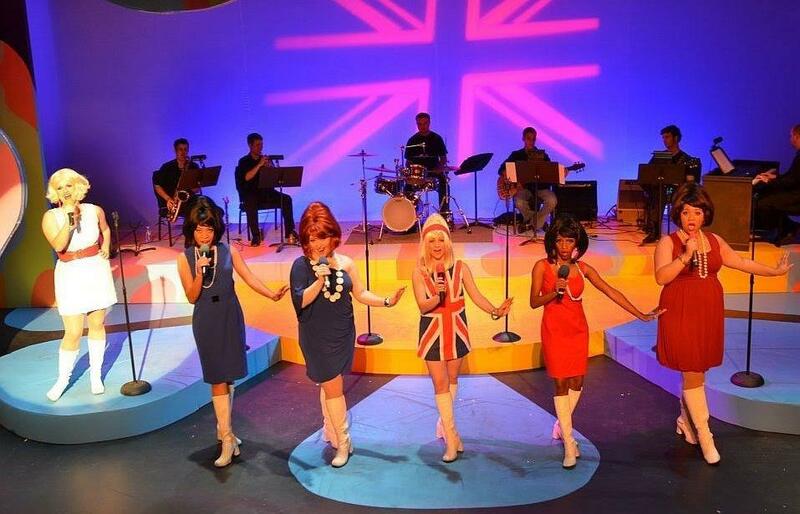 (L-R) Christina Stroup, Lori Callaway,Kim Truncale, Lendsey Kersey, LaKaiya Evans, and Rikki Conner in The Texas Repertory Theatre Production of BEEHIVE! Photo by Larry Lipton. Our six stars unite on stage for a joyful final medley of “Make Your Own Kind of Music,” and “I Hear A Symphony,” while each of them cleverly pops out of a giant hairspray can for final bows. It was all so wonderful it helped me to forget the often annoying Act One. That part of the show had great tunes like “The Name Game,” “My Boyfriend’s Back,” “Sweet Talkin’ Guy,” “One Fine Day,” “Will You Still Love Me Tomorrow,” “It’s My Party,” “I’m Sorry,” “Judy’s Turn to Cry,” and “Where the Boys Are.” So how could I find all that annoying with six lovely ladies with great voices performing the songs? The answer lies in their beautiful voices being drowned out much of the time by the screeching audio volumes and the loud band that was directly behind the gals on the stage. By some miracle those problems all seemed resolved for the delicious Act Two. Why not go see and hear for yourself? Hopefully Act One will be toned down by the time you get there. 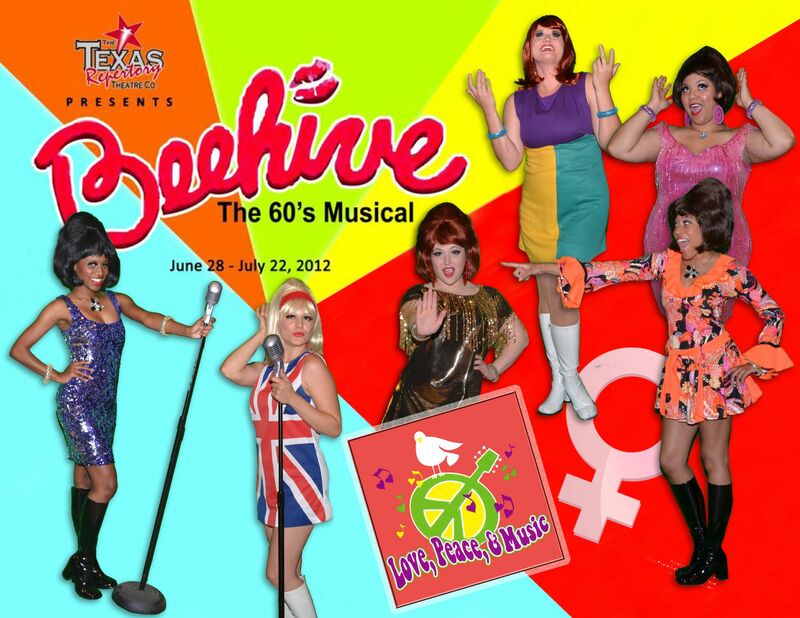 BEEHIVE the 60’s Musical continues through July 22nd at Texas Repertory Theatre, 14243 Stuebner Airline Rd., Houston, Texas. Performances are Thursdays at 7:30 pm, Fridays and Saturdays at 8 pm, and Sundays at 3 pm. For tickets and information call 281-583-7573 or visit the website at http://www.TexRepTheatre.org. This entry was posted in Broadway, BroadwayStars.com, Concert Reviews, Texas Repertory Theatre and tagged Broadway, concerts, Entertainment, Houston, musicals, Texas Repertory Theatre. Bookmark the permalink.